Let me relate this again: a few months ago Joan Belmar and a group of friends got together and decided to help a small organization called The Family Place. The mission of Family Place is to work with mothers and children, prevent domestic violence, and provide healthy meals to children and parents. 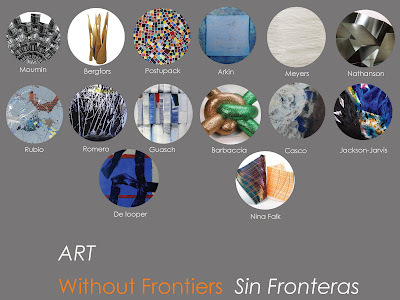 Now he has curated an art exhibition, Art Without Frontiers, put together to raise funds for The Family Place. The opening reception is Oct. 30th from 6:30 - 9:30PM at the beautiful Cultural Institute of Mexico in DC. Details here and RSVP required to lfleitas@thefamilyplace.org. Artists include Sondra Arkin, Joseph Barbaccia, Constance Bergfors, Salvados Casco, Nina Falk, Carles Guasch, Willem De Looper, Adrienne Moumin, Linn Meyers, Martha Jackson-Jarvis, Minna N. Nathanson, Kevin Postupack, Katya Romero, Raimundo Rubio and I am proud to also be part of this effort. Instead of dining out on October 30, why not join us for this reception? It's a tax-deductible contribution. If you choose to buy some art, your tax-deductible contribution will go even farther since 50% of the sales will go directly to The Family Place. See ya at the opening!